A mixture of vegetables and potatoes. 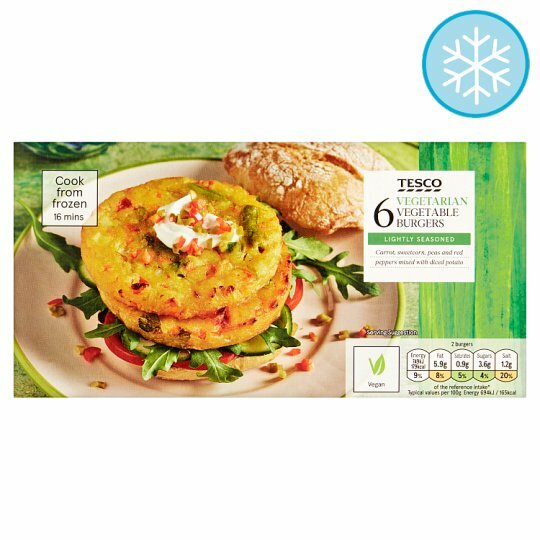 6 frozen vegetable burgers made with carrot, sweetcorn, peas, red pepper and potato. Vegetables (82%), Rapeseed Oil, Rice Flour, Potato Starch, Salt, Stabiliser (Cellulose), White Pepper, Turmeric. Vegetables contains: Carrot, Onion, Dried Potato, Potato, Sweetcorn, Peas, Red Pepper, Green Bean. Instructions: Oven: 200ºC/Fan 180ºC/Gas 6 14-16 mins For best results, oven cook. Place on a baking tray in the centre of a pre-heated oven for 14-16 minutes.